If you own a crossover or SUV and want a tire that provides the best cornering grip, as well as wet pavement traction, then the Michelin Latitude Sport is the tire to have. We do not say that lightly, but Michelin has done it all with this model. The attractive tread design features an asymmetric tread pattern to go with a tread compound that consists of a hybrid silica and carbon black mixture. This results in plenty of dry traction for the vehicle. A high silica compound on the inside shoulder enables good traction on wet surfaces and lowers the risk of hydroplaning. Larger shoulder blocks and a continuous center rib provide excellent steering response and even more driver confidence behind the wheel. Cornering on the Latitude Sport has to be experienced to be believed. It is that good. Wider grooves which run on the circumference of the tire which ensure excellent traction on wet surfaces. The grooves help channel water away from the tire, giving it solid grip wet roads. Strong twin steel belts support the tire and provide durability to the tire. These twin belts are reinforced by size optimized, well placed aramid and nylon filaments. This feature prevents distortion of the tire and ensures stability, not to mention a more comfortable ride. Overall, the Michelin Latitude Sport provides incredible performance on both dry and wet pavement. Grip in the corners is the best in this class. The ride is comfortable and road noise is non-existent. The only drawback, if you want to call it that, is that the tire can be expensive for some. There’s a reason why this model has been chosen as original equipment on some of the world’s best high performance SUV’s…it simply delivers the performance you are looking for. Get the best tire price with coupon below, or find other Michelin tire rebate coupons. Prices on the Michelin Latitude Sport Tire range from around $300 for the 18 inch series tires to approximately $500 for the 21 inch series tires. Who Are Michelin Latitude Sport Tires Designed For? The Michelin Latitude Sport is designed for drivers of SUV, minivans and crossovers who are seeking a high performance tire that grips corners like a sports car regardless of wet or dry pavement, while also being as quiet as any tire in its class. 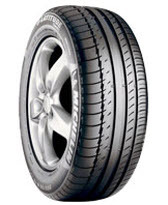 Michelin backs up the Latitude Sport tires with a 6 year or 20,000 mile tread life warranty. (Half mileage on rear tires if they are different sizes than front.) Tire uniformity is guaranteed for the first year or first 2/32 inches of wear. Materials and workmanship are guaranteed for 6 years and include a free replacement in the first year or first 25% of wear. Michelin follows that up with a prorated amount down to the final 2/32 inches of useable tread on the tire. There is also a 3-year flat tire changing service included, as well as Michelin’s 30-day satisfaction guarantee.